The London Cruise Show is back again at Olympia Saturday/Sunday 16 /17 February with a number of cruise operators and peripheral holiday suppliers exhibiting, plus a series of lectures. (See Hosted in London to get to Olympia). The show is ideal if you have never been cruising or are thinking of a return. It is a fine place for brochure collection, preferred by many to scrolling through the screen; ask simple questions of operators, and perhaps best of all sitting down and listening in the 'Ask the Experts' sessions running throughout the show. The New to Cruise theatre is the place for any new cruisers to listen and be part of talks and seminars. The free talks will be hosted by a range of cruise lines and travel experts helping you to choose what cruise is for you. In these sessions, you will hear from cruise line executives, industry experts and journalists who will share their insider knowledge and tips. Another highlight this year will be the Expeditions Theatre where a rapidly expanding part of the market will be explained. If it is the Arctic or Antarctic you want to see this is usually supplied by smaller specially reinforced ships, but this style of holiday is also covered with the Galápagos Islands in the Pacific, 600 miles off the coast of Ecuador. More for the enthusiast but offering a fine periodical magazine the Ocean Liner Society (OLS) will have a stand (A8) with some non-aligned real experts ready to offer advice and have a chat. They will also be promoting the OLS Ship Show Saturday 16 November once again at Southampton’s Masonic Hall, from 10:00 to 16:00. This one is really for the aficionados at the home port of British cruising. We are indebted to Cruise Critic where you can find more details of the ships noted below and what follows is a guideline and not a complete list. Douglas Ward’s Cruising and Cruise Ships is another source. In total 17 cruise ships are set to debut in 2019. The following year could be very exciting with Virgin Voyages Scarlett Lady set to make her maiden voyage. For BTN’s December 2018 Cruise Supplement Ken Brookes, the former president of the Chartered Institute of Journalists focused on the maiden voyage of the Nieuw Statendam, flagship of Carnival’s Holland America Line, from Rome to Fort Lauderdale, Florida. The trip, still in progress at that date, was also a transatlantic delivery to the US from Fincantieri, the Italian shipyard near Venice where it was built. She will cruise the Caribbean from Fort Lauderdale until April, then in Europe from Amsterdam until October, when it will again reposition to Fort Lauderdale. Ken writes this piece in his own style and is more than happy to comment in a spirit of helpfulness regarding what was is a fine ship. He took the pictures too. Do read the last paragraph. It could have been used in AND FINALLY. 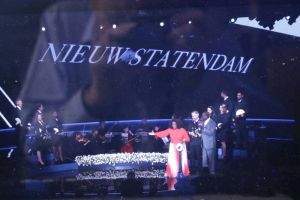 The shipping line’s marketeers decided to save the razzmatazz for a live-streamed naming ceremony by 'godmother' tycoon and TV icon Oprah Winfrey on 2 February, a tie-up with Oprah’s 'O' magazine and a girly-themed launch cruise. The actual dedication was preceded by a series of promotional videos about the ship and its future itineraries and ended, by virtue of the theatre’s advanced electronics, with godmother Oprah smashing a virtual flagon of champagne against the virtual bows of the virtual cruise ship. We covered the basics of the ship and its maiden cruise in my first report. This further instalment has three main themes. If you want to see the world, there’s nothing like a cruise to get you there, but for the handicapped it’s something else. 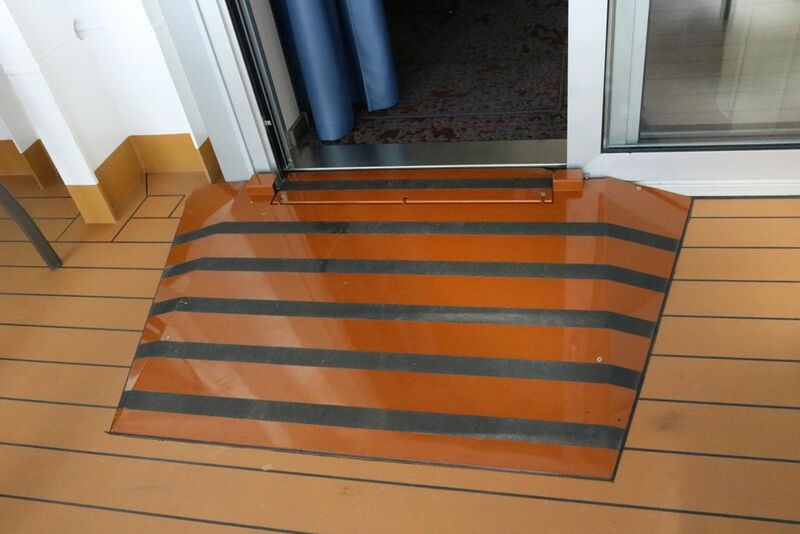 On a typical cruise ship, all decks are linked by lifts as well as stairs, and theatres have wide open spaces for wheelchairs and for others who find staircases difficult or even impossible. Most modern cruise lines pride themselves on accessibility and attractiveness to those with walking and other disabilities, and the Nieuw Statendam is no exception. So-called accessible cabins or suites are limited in number, but due to their extra facilities are much in demand. On many ships they are fully booked as much as two years ahead and the companies are necessarily strict in requiring detailed recommendations by the traveller’s personal doctor. We’ve met individuals who’ve made a modern cruise ship their permanent abode, with excellent food, room service, top-class entertainment, ever-changing scenery, state-of-art medical services at a moment’s notice and often far less expensive than a typical care home. BTN’s recent warnings about poor facilities for the disabled at Luton Airport were picked up by at least one British TV programme, but here we’re talking about the opposite. For accessibility, a cabin must be sacrificed. The furnishings stay the same as in standard accommodation, but now there is sufficient room for manoeuvrability. The door is widened and the enlarged bathroom completely redesigned. According to my wife, (who is registered handicapped), the Statendam design is one of the best anywhere, even in 5-star hotels. The regular bathrooms on this ship are a cut above the average, having sensibly large rectangular showers with sliding glass doors, but the 'handicapped' designs are different, with completely flat floors and a spacious, curtained square area entirely surrounded by flush slatted floor gratings. These catch all the water, even from a full-power shower, and in ours not a drop escaped. Wonderful. 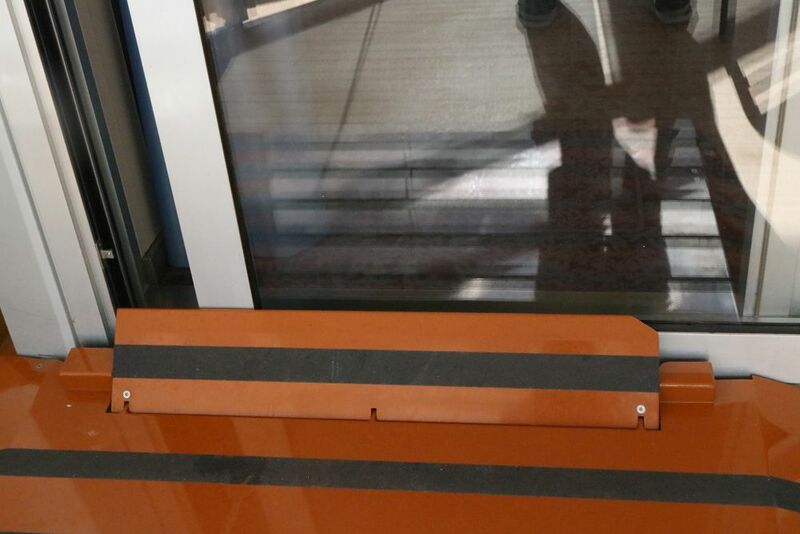 At the balcony, the track for the sliding door stood proud of the floor by a few centimetres, but was covered by a cunningly designed shallow ramp, which retracted as the door moved across. Could any item have been missed? Well, yes. Not only could it have been missed, but it was – and this item was important. 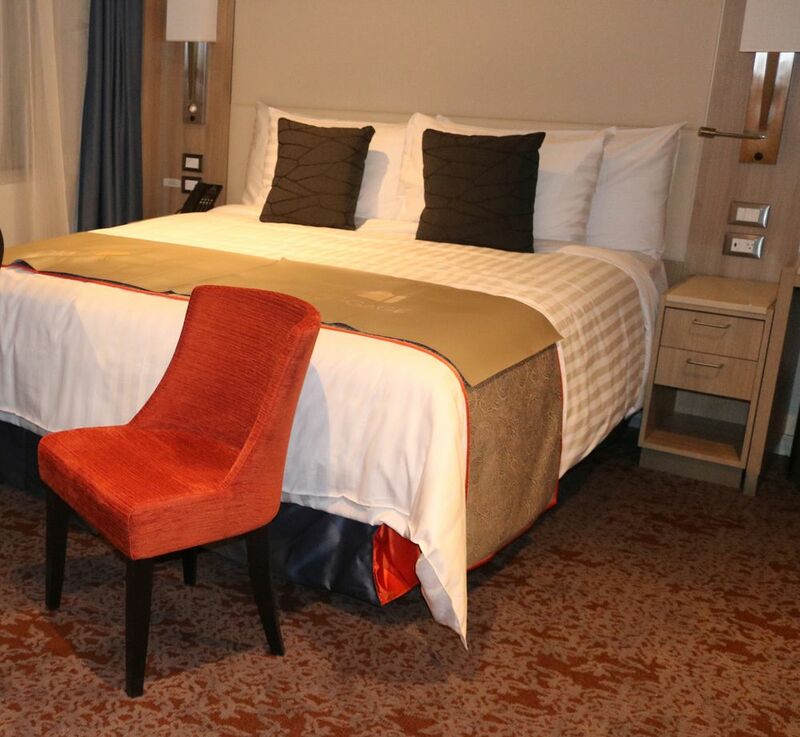 Like many world-famous hotel chains, Holland America rightly prides itself on the quality and comfort of its beds and bedding. All the cabins and suites have beds of similar design. The mattresses are reassuringly deep, and there’s impressive storage space below to hide really large suitcases. But to get into the bed, the user has to climb a 'step' more than a metre high, and the accessible cabins are intended for individuals for whom even centimetres can seem massive obstacles. When I met hotel director Don Habets I was deputed by several handicapped passengers to describe the time, ingenuity and acrobatics needed just to get in and out of one of those otherwise excellent beds. Surprisingly, it seemed that no one at the line had previously considered this problem. I suggested that, as an immediate, rapid and relatively inexpensive remedy, beds could be lowered by a ship’s carpenter or engineer with a saw, eliminating the storage space beneath. There was ample floor space in the real accessible cabins to provide substitute storage elsewhere. Alternatively, yet another small ramp might be provided. I put this suggestion in writing later, on the comment sheet given to all guests on their last day aboard, but don’t know whether anything has happened since. Don’t be fooled by the expression 'ambulatory' applied to some of the other 'accessible' cabins, all of which are intended for passengers with limited mobility. As far as we could tell, the 'ambulatory' were normal-sized cabins with normal doors (too narrow for most walking frames, as were some of the spaces between the standard furnishings) and the difficult-for-some normal step up to the bathroom. There may be differences with the shower controls, but not much else except perhaps favourable location near to elevators. Our otherwise very knowledgeable Hotel Director couldn’t think of anything else during our short meeting. To gain the interest of BTN readers, there’s nothing like mixing all three themes – business, travel and news – and that’s more or less the story of the Nieuw Statendam’s art collection. For the British readership, you might consider Holland America a 21st century Charles Saatchi. 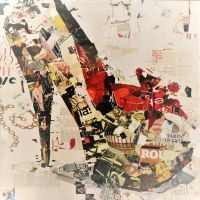 After a long and successful career as an advertising tycoon (with his brother Maurice he helped build Saatchi and Saatchi into the biggest advertising agency in the world), Charles decided to enter the art business. He rounded up a group of young and promising assorted artists, purchased much of their output at low prices, displayed and cleverly promoted their work, especially in his own new gallery, then built another fortune from his share of sales proceeds. Whether or not they are deliberately building on the Saatchi success, Holland America certainly seem to be following the same route, but with a seagoing twist. Unlike Charles Saatchi, however, the cruise line has recruited its young and promising artists from around the world, purchased a substantial amount of their work (and probably contracted for much more), then turned their new flagship into a seagoing art gallery, ready for business. 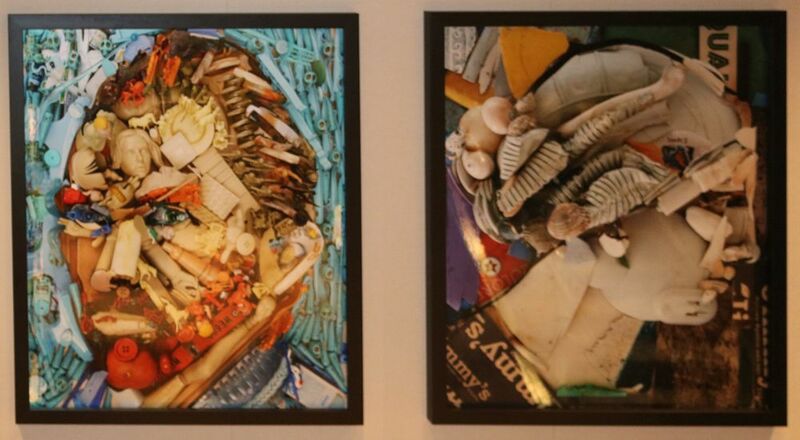 When company president Orlando Ashford told the assembled Nieuw Statendam passengers that every artwork on the ship was for sale, he drew a host of surprised gasps, but meant nothing less. No doubt there is a store-room somewhere on the ship, crammed with substitute pieces ready to slot into place, and strategically placed somewhere there’s an onshore warehouse or warehouses, ready to replenish that store. So to round off this little digression, here’s a random selection from the launch art exhibits in the Nieuw Statendam “floating gallery”. They comprise traditional, modernistic and frankly weird paintings, photographs and collages, sculptures and constructions, and a lot more. You’ll find them in every one of the 30-plus elevator lobbies, on every staircase, and in restaurants, entertainment centres and public rooms. At a presentation to passengers in the big theatre, we were learning about the ship’s future itinerary. I paraphrase: “We intend to spend time on the Pacific coast and the Alaska run, but to do that we have to go right around South America as we can’t manage the Panama Canal.” How could that be, when the official 'Panamax' ship dimensions seemed to guarantee it could get through the locks? Apparently the lifeboats stuck out too far and there wasn’t a clear view all the way down each side to be sure of avoiding contact with the lockside, in some places only a metre or less away.